Maybe someone should go check on Heinz. Yes, it's been a strange few months of increasingly bizarre product releases, but this latest one is somehow ever stranger. First, there was Mayochup. Then Mayocue and Mayomust. And last of all (so we thought), came Kranch. This is Heinz Cadbury Creme Egg-Flavored Mayonnaise. 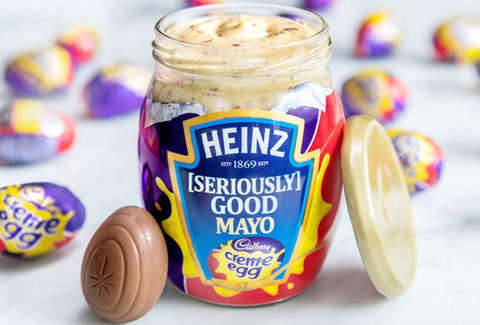 It's a sauce made from Heinz Mayo with Cadbury Creme egg fondant and chocolate, and we'd like to be the first to say, "WHAT." The product was first fake-announced on April Fool's Day, but Heinz then reannounced it on April 2 and revealed that it was, in fact, for some reason, real. You'll probably be relieved to learn that Chewboom reports it'll only be available in the UK -- and just only for a limited time as a 150th-anniversary celebration. If you happen to live in the UK, just hide until supplies run out.